Sirens is a site-specific installation that draws on the classical myth of the sirens and modern uses of sirens to discuss the tensions surrounding issues of attraction, repulsion, danger, stability, violence, seduction, and fear. 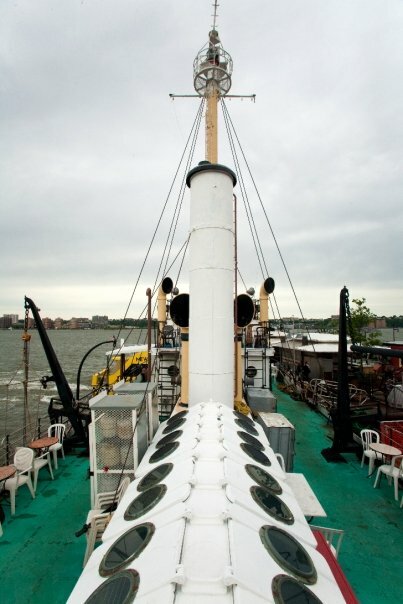 The piece was commissioned by the Electronic Music Foundation, to be installed on the Lightship Frying Pan, an historic vessel moored at 26th Street and the West Side Highway in Manhattan. The Lightship Frying Pan originally served as a safety vessel, which warned other ships of shoals and shallow water using light and sound. In classical mythology, the sirens were “three beautiful bird-women” known for their mesmerizing, alluring, and ultimately deadly songs, which they used to seduce sailors passing by their island, who would be uncontrollably drawn towards them and would crash their ships on the rocky coast. In contrast to our current use of sirens as audio signals that warn of danger or clear the path of safety vehicles, certain sirens currently are being developed as “non-lethal” acoustic weapons that disrupt equilibrium and impair motor control, creating dangerous or violent situations through the use of psychoacoustics. 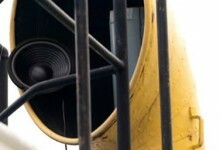 Sirens examines these various purposes of sound and the ship. In the piece, the ship is imagined as a dynamic, sentient, female being, who is given voice and articulates these conflicting yet coincident powers embodied in the sounds and spaces associated with the vessel. 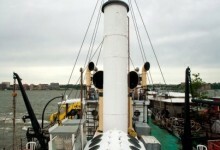 The ventilation tubes that originally allowed the ship to “breathe” by bringing fresh air to the body of the ship now are used as resonators to amplify speakers, which emit processed recordings of female voices sighing, vocalizing in seductive/sexual ways, and mimicking sirens, combined with sampled land- and sea-siren and foghorn sounds, and the live sounds of the ship’s motion. The sounds are constantly changing and are triggered by (and incorporate) the moaning and screaming sounds generated by the rocking of the boat against its entrance ramp and ropes. 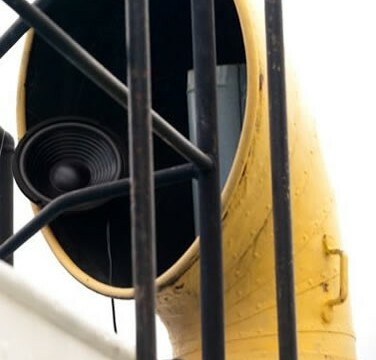 The sounds are spatialized throughout the ship, sometimes creating the beating patterns used in acoustic weapons to create confusion and dizziness, sometimes overwhelming the deck with a wash of soft vocal music. 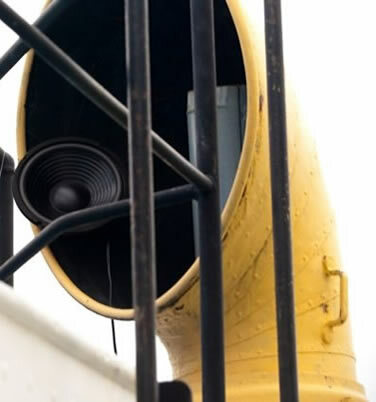 The sounds are audible on the ship, and also are designed to emit from the ship and travel across the water to the west and land to the east, affecting the surrounding public space and drawing in and/or alarming nearby listeners.